After supporting Data Step programming for many years, Sharon took the opportunity to be a stay-at-home Mom. After 12 years she returned to SAS Technical Support in 2015 supporting Foundation SAS. 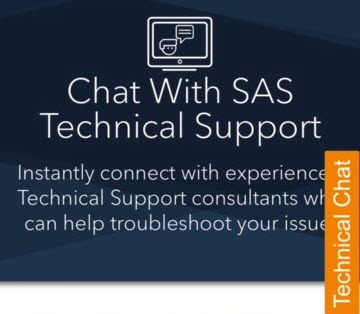 Did you know that you can now chat with SAS Technical Support? Technical Chat enables you to quickly engage with a knowledgeable consultant when you have a SAS question or need help with troubleshooting an issue.